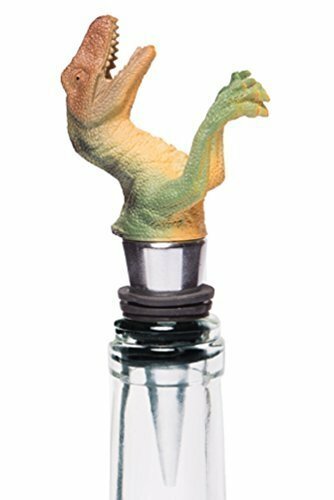 No doubt you'll have a ROARING night of fun when you CHEWS to save your wine with this realistic dinosaur bottle stopper. Fashioned with the paleontologist in mind but ideal for the novelty trhill seeker and a a deninite must for every Dino-Sir. This resin crafted Velicoraptor will make your bottle of wine stand out at any gathering. It's business end is forged from polished stainless steel and is fitted with flexible ridges to make a secure seal. Measures approximately 4.75 inches from tip of snout to bottom of the stainless steel point. Please Consume Responsibly.